Kethira describes the world beyond the misty Harnic Isles. Explore the three continents of Lythia, Mernat and Kamerand, and vast worlds beyond. Follow the rise and fall of empires and peoples throughout history in maps and chronology. 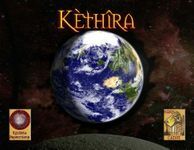 This module, through fifteen, full-colour, full-page maps and accompanying text, describes the history, politics, geography, climate, precipitation, winds, currents, tectonics and natural vegetation of the whole world of Kethira. Also covered are the night skies, and the Kethrian family of Worlds. There is a wide worldf out there... all here to see!